When Melissa McCarthy dropped by Saturday Night Live last week to play Hubba Bubba lover Sean Spicer, she alternately wielded a Super Soaker and her podium. It was, as far as we can tell, a dead-on impression, and it looked like she (and the audience) had a grand old time. What we didn’t see was Alec Baldwin standing somewhere in the wings, looking on wistfully as McCarthy trashed the stage. Baldwin’s been holding down the politician stand-in game for about a year now, first playing a ridiculous presidential candidate, and now, a vituperative head of state. Those impressions are both of Donald Trump, our ever-apoplectic president. If you were thinking that channeling that much anger and who knows what else could wear on a guy, you’d be right. Baldwin recently admitted to Extra that “playing him is not a lot of fun. He’s tense, he’s angry, he’s pissed off, and that’s not fun to play.” Being such an, um, even-keel dude, that must not sit well with Baldwin, who might also be tired of turning his face into a sphincter. 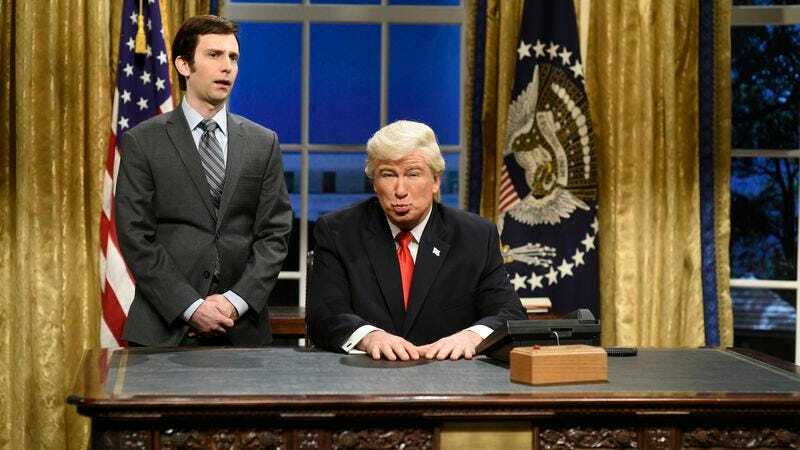 Perhaps SNL’s writers should consider giving Baldwin new material, thereby reigniting his passion for playing the president. Right now, it sounds like the gig’s grown a bit tedious: “Another thing I find that’s so weird about the stuff we’re doing, we’re just repeating back what he says. Doing this is strange, but what is even more strange is this is real.” Of course, that’s the problem that so many comedy writers encounter these days—when it comes to our tweet-speak president, there’s not much fiction that could be stranger than the truth.